Activists from Fight Racism! Fight Imperialism! and supporters of the Glasgow Defence Campaign held a "Speak out against the Cuts!" event at the Royal Bank of Scotland on Gordon St in Glasgow City Centre on Saturday 2 April. A loudspeaker, banners, petitions, leaflets and newspapers were used to draw attention to the £7.7 million payout recently given to Chief Executive Stephen Hester. 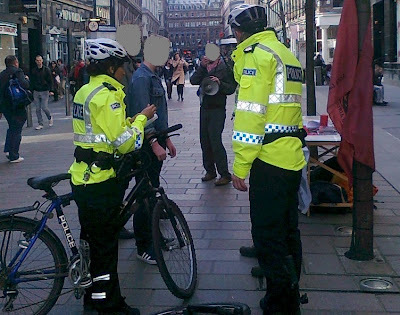 At 2.30pm, PC Stephen McAllister and WPC Manpreet Jassal of Stewart Street police office arrived on bike and approached activists, demanding personal details of an organsier. No crime had been committed and so the officers’ demand was challenged and refused. This was deemed 'obstructive' by the officers who said that they would have to call their supervisors. Anti-cuts activists demanded the right to organise and received support from the public. Two more officers were drafted in before all four were forced to clear off having failed to intimidate those on the event.